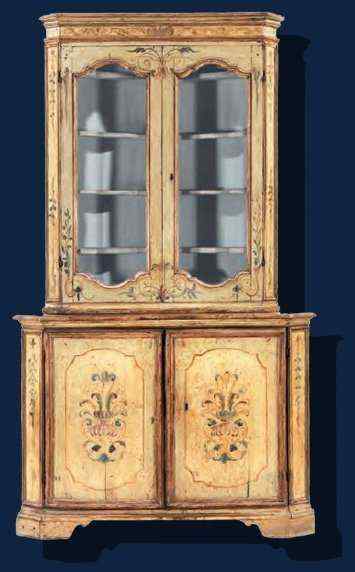 Second half of the 17th century Double-body cupboard Lacquered wood, 240 x 138 x 69.5 cm One of the most particular and fascinating techniques in furniture making is the art of lacquering, known and practiced in the Asian Far East by Chinese and Japanese up from the most remote ages. Europe became interested only at the beginning of the 1600s. The first to bring it to the European continent were the Portuguese and the Dutch, merchants and colonizers of those regions. They had received news from Catholic missionaries who extolled and praised their quality and technical perfection. 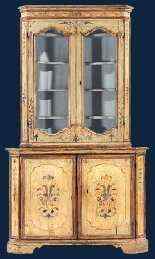 Soon the use of lacquered furniture and objects became so general that they felt the need, in the major cultural and artistic centers, to investigate in order to obtain the results of the Oriental technique, in order to create the same objects in Europe and thus benefit on the purchase price. In China the technique of working lacquers was kept in the greatest secrecy, but the news leaked the same and it was discovered that the Chinese paint was not a composition but a special resin that dripped from a tree expressly cultivated. European lacquers imitated by imported ones are composed of various essences, mixed resins and various oils. In fact, both in France and in Italy or in England the lacquers are never as hard as the oriental ones. This diversity consists mainly of gypsum and glue preparation.